For that special accommodation on your next visit to Northeast Florida select a house, townhouse, condo or villa from Ormond Beach vacation rentals. Oceanfront, bay front and interior locations are available within this island community. Designed with the casual Florida visitor in mind, Ormond Beach vacation rentals feature furnishings and decor matched to enhance your leisure experience. Whether your daily pursuits take you for early morning walks on the sandy beach or fishing in the Atlantic Ocean and bay backwaters, Ormond Beach vacation rentals can provide the restful, relaxing, spacious accommodations that will allow you to unwind from the days activities. Ormond Beach is just North of Daytona Beach and within comfortable driving distances to the central Florida theme parks, the Kennedy Space Center and the treasures of St. Augustine, Florida. The city welcomes you to its beaches, renowned since the turn of the 20th century as drivable beaches, and invites you to explore its history from its primitive days as an Indian settlement, to its heritage among automotive racing pioneers established in the early 1900's, to its place as an early Florida resort area for the rich and famous. 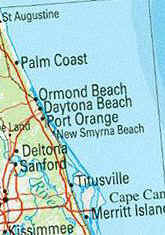 Tour Northeast Florida and more from the houses, condos and villas of Ormond Beach vacation rentals.